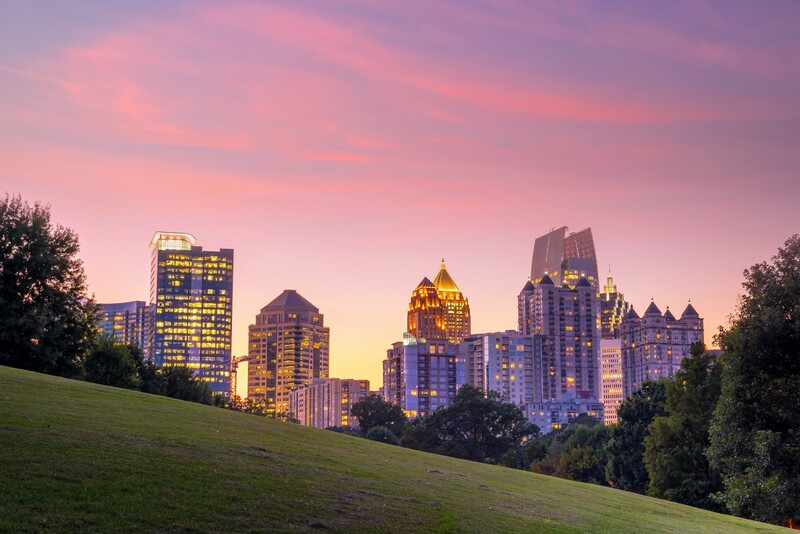 As the Atlanta skyline grew closer, tears began to spill from my eyes. “I don’t want to do this,” I kept repeating to myself. For a second, I thought about turning around and driving back to DC. If I left now, I could be back by the morning. But I had no home there anymore. And all my furniture was already on its way to meet me in Atlanta, the place I didn’t want to be. Everything had gone wrong. I was starting to believe the universe was trying to send me a very harsh message that this move was a terrible idea. The apartment I had lined up had fallen through an hour before my movers cancelled on me. Unable to move my stuff until the following day and unwilling to do it unless I was present, I was now going to have to miss my flight. And on top of all of that, I wasn’t able to rent a car, because, to my surprise, my bank account had been closed, and my credit card had been canceled. Divorce is an ugly game. I had managed to somehow pull off getting a rental car and an apartment and was finally on my way when the reality of the situation hit me: “You’re completely alone.” I was still trying to make sense of everything that had happened to me over the last several months. But replaying the situation seemed to make things worse. No matter how much I wanted to blame other people, it wasn’t fixing my situation. I was still alone, heading to a strange city. I had never driven a car alone for longer than an hour before, and I had especially never driven across the country. But I had no other choice, so I did what needed to be done even though I did it begrudgingly. I arrived at my new apartment. It was beautiful, far nicer than anything I could have afforded on my own in DC. But I hated it. I hated everything about it. Forget the fact that my furniture was not scheduled to arrive for another month, this was not my apartment. This belonged to someone else, someone with a different life and a different story than mine. I should have been grateful to have anywhere to live. I should have been grateful that I was even able to arrange to have my furniture and belongings brought to me. But I couldn’t see any gratitude in the situation, at least not then. In fact, I couldn’t see anything but my own pain and suffering. The sorrow was contagious and it spread through my body like wildfire. I was hopeless and lost in my own self-pity. I never wanted to leave DC. I never wanted to leave the few friends I had left there either. But I had a job in Atlanta and the promise of a new life, even if it wasn’t the life I had pictured. As the weeks turned into months, the bitterness grew. My powerlessness over the situation seemed irrevocable. I wanted to leave, but I loved my job. And truth be told, I had never been on my own in DC before. In fact, I had never even had to pay rent before. But instead of using this as a challenge to face and then overcome, I lost myself in the sadness. I vowed to make sure Atlanta would be a terrible experience. I promised myself I would have no social life. I would become a recluse until this period of my life was over. Every moment I wasn’t working was spent scheming and plotting ways to get back to DC as soon as possible. I didn’t want to wait a year for my lease to expire. I wanted to leave now. And if I couldn’t leave, I would make sure things were terrible enough that the negativity served as an incentive to eventually leave. I turned down social invitations, I closed myself off from people, and I spent every moment of my free time sobbing over how horrible my life was. And yet, for some reason, there were still people who had some sort of vested interest in making sure I was okay, even though I did nothing to deserve their friendship. Not surprisingly, the more resentful I grew, the worse the situation became. And while some of what happened was out of my control, I was always in control of my response. But I did not see these obstacles as opportunities for growth. I saw them only as examples of how the world had wronged me. With each fresh new hell that I encountered in Atlanta, I withdrew further and further into my own head and pushed others away. I didn’t want to fight. I didn’t want to persevere. I just wanted it all to go away. While an existence free from burden might seem pleasant, it is also unrealistic. And the worse my attitude was, the less prepared I was to deal with the hand life had dealt me. Everyone around me knew I was miserable, I made no attempt to hide it. I insulted Atlanta at every opportunity, and I reminded everyone who would listen that DC was better in every possible way… until a friend had the courage to tell me what needed to be said. “Why are you punishing yourself Brittany?” This took me aback. I wasn’t doing anything; the world was doing this to me. This couldn’t possibly be my fault. The cards were stacked against me, and I had no choice in the matter. It was everyone else punishing me, but not me. I opened my mouth to speak, but no words came out. I had no retort. Anyone who knows me personally knows I am rarely at a loss for words. But I had no response because my friend was right: I was responsible for my own misery. I really wanted to ignore this conversation. I wanted to go back into my miserable little corner of the world and curse all those who had contributed to my unhappiness. But condemning others did nothing for me but infect my heart with hate and hopelessness. Warm tears ran down my face, but these were different than the tears I shed on the way to Atlanta. These tears were filled with hope, hope I thought I had killed off long ago. Okay, I thought, I don’t have to be miserable today. If I want to be miserable again tomorrow, that was fine. But today, I was going to attempt happiness. Something clicked. But that didn’t mean life was magically easier. The pain wasn’t eradicated simply because I had decided not to hate life that day. But the burden became easier to bear. The morning after that, I woke up, assumed my meditative position, and again asked the question, “who or what was I resisting?” Again the answer came, “Myself. Other people. Happiness.” So for the second day in a row, I decided to stop resisting. I was going to attempt happiness. And again, things were not magically healed, but they came easier. This continued, each time yielding similar results. The hurt and the longing for DC did not cease, but when I stopped resisting myself, I was able to handle what life was throwing at me and I was able to find joy in the here and now. I don’t know that Atlanta will ever be home to me the way Washington, DC is home. And I still plan to return to DC someday. But I’ve decided to be here now and make the best of this time. Happiness is a choice, and while I would love to tell you that it is easy, it isn’t. But it’s worth it. All we can really do is live in the present and make a conscious choice to be happy. Because if we do not, the only person who suffers is us.